Four years later after the masterpiece Legends of Blood and Light (2008) and last year’s acclaimed acoustic release Beyond the Woods (2011) and the presentation on the November 2011 EDEN TOUR with German legends FAUN, TROBAR DE MORTE is back with a new milestone in the saga and their fifth album. 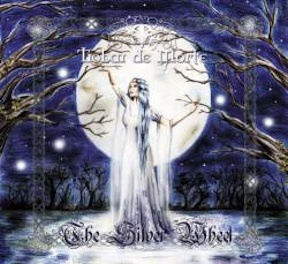 The Silver Wheel is a mystical & spiritual journey through Celtic Mythology, an inner interpretation chant of our ancestral Celtic goddess The Silver Wheel (in reference to the powerful and magic moon, the natural satellite of Earth) in hymns like “The Silver Wheel“, “Riding the Wheel”… Tales, legends, myths of ancient celtic classics are masterfully interpreted in songs like “The Mist of Avalon’, ‘Morgana’, ‘Arianrhod’, ‘Nimue” or TDM’s own version of ‘Kyrie Eleison’. Deeply rooted in paganism and Gaelic tradition are songs like ‘The Pagan Way’, ‘Samhain’ (the Gaeelic Harvest Festival) and fantasy themes like “In the Garden of Serenity’ or ‘Moonspell’. Musically the album reflects composer Lady Morte´s constant predilection for increasingly lengthy and pro- gressively dramatic, genuine medieval dark folk hymns. These 13 pearls were cultivated on the waters of Celtic mysticism fountains by a medieval wise goldsmith. Trobar de Morte’s liturgical and emotional summonings open the old wooden gate to enter the glorious times of King Arthur, Lancelot, Morgaine, Uther Pendragon. Ages where high adventures took place on wild dreamy landscapes… A maximum of musical creativity and elegant, majestic and clear soprano vocals are only one trademark of TDM’s absolutely unique sound. The music is grounded on traditional medieval, folk and classical invocations, masterfully enriched by ceremonial rhythms and trivial percussions under the spell of The Silver Wheel. The Silver Wheel was the name that the Celts used for the moon – also known as the protective goddess Arianrhod, Goddess of beauty, fertility and reincarnation. Her time is the Winter Solstice.. she brings the cold, the snow and the ice. Of her is the energy of the states situated between life and death. She’s the guardian of the Past, the Present and the Future. She is the silver threads of the rays of light and the darkness of shadows. Enigmatic, serene and eternal, she contemplates us from the highest skies. …she is and she will always be by ever and ever our beautiful silver wheel..